Turkey Club Wrap: Deli turkey, lettuce, tomato, avocado, and bacon are wrapped up in a tortilla for a quick turkey wrap, perfect for lunch. If you asked my husband what he wants for lunch, he would say Oh I don’t care, just pack me a Peanut Butter and Jelly Sandwich. And for years, that is just what I did. I mean, there is just something about a good old peanut butter and jelly. However, I recently learned that he only said that because he thought it was the easiest thing for me to pack him. While he loves peanut butter and jelly, he really loves so many other things as well. A club sandwich is made with bread, sliced cooked poultry, or fried bacon, lettuce, tomato, and mayonnaise. 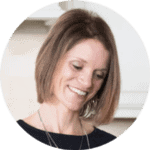 I took the basics of a Turkey Club Sandwich and created a delicious Turkey Club Wrap. 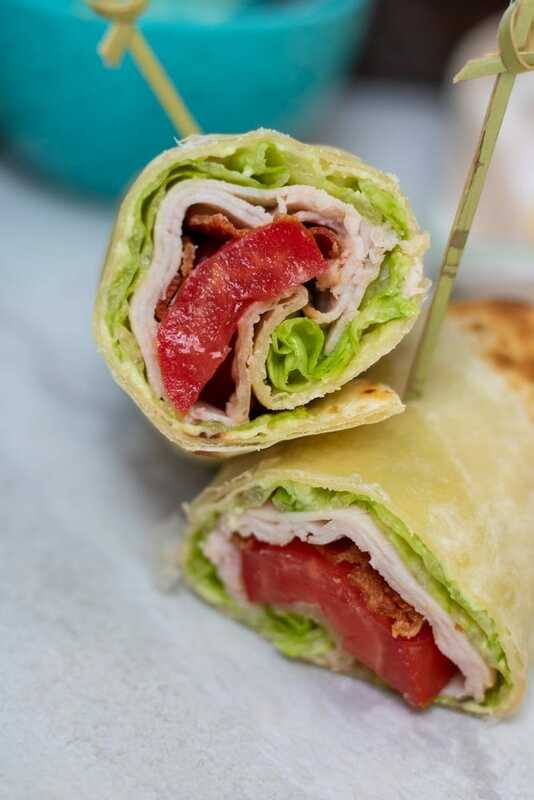 A whole wheat wrap is smeared with an avocado and mayonnaise spread and then wrapped up with green leaf lettuce, sliced deli turkey, crisp bacon and fresh tomatoes. Sort of like a Turkey BLT Wrap or Turkey Club with Avocado. Whatever you call this wrap, it is good. A club sandwich is traditionally served with mayonnaise. But I love the addition of avocado on a club, so I decided to combine the mayonnaise with the avocado, to create a creamy, fresh spread perfect for these Turkey Wraps. Evenly spread a think layer of the Avocado Spread over a tortilla, leaving 1/2 inch border around the edges. You want place your lettuce over on the bottom of the wrap so that it will help to prevent the Turkey Wrap from getting soggy. I like to use green leaf lettuce, as it is soft and rolls easily. Feel free to use romaine lettuce or iceberg lettuce, you may just want to cut out the hard center of the lettuce leaves, so that it will roll better. Now for the goodies, add 3-4 slices of thin sliced turkey meat and then top with cooked bacon and a sliced, seeded tomatoes. *Be sure to remove the seeds from the tomatoes to help keep the Turkey wrap from being soggy. Tightly wrap up the turkey wrap and secure with a toothpick or wrap in plastic wrap. Fold in the sides of the tortilla or wrap. Bring up the bottom flap and then continue to roll from the bottom up. These turkey rolls also make great pinwheels that are perfect for children’s lunch boxes or to serve as an appetizer. Prepare Turkey Wrap as directed. After rolling up the turkey wrap tightly, instead of cutting in half, cut into 1 inch circles. Secure each turkey pinwheel with a toothpick. I love to serve these turkey club pinwheels with a side of guacamole for dipping. 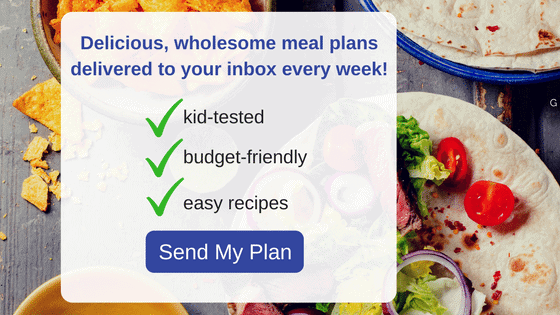 If prepared correctly, you can make these turkey wraps up to 3 days in advance and store in the refrigerator until ready to serve or pack for lunch. These Turkey Wraps are great served with a side of Guacamole for dip. 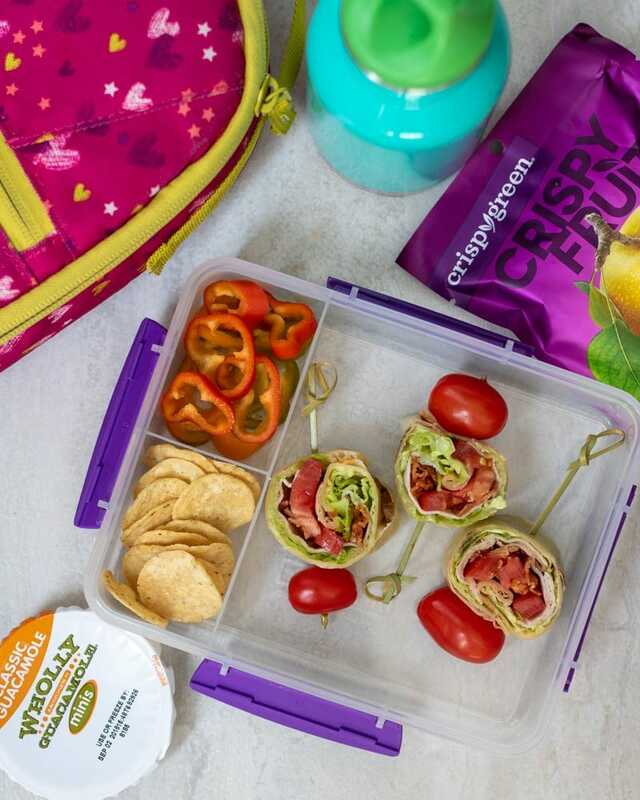 I like to add a Wholly Guacamole in my kids’ lunchboxes for them to dip their veggies, chips, or these tortilla turkey wraps in. Feel free to use leftover roasted turkey in place of the deli turkey slices. 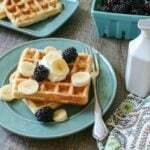 You can also use ham, roast beef, or leave off the deli meat altogether and just serve a BLT wrap with avocado. If you do not like avocado, just use mayonnaise on this wrap. Sometimes I even just use honey mustard which some restaurants use on their club sandwiches. If you do not like mayonnaise, or need this Turkey Wrap to be Dairy-Free, simply mash up your avocado with lime juice and salt and smear that on your wrap. Be sure to seed your tomato as best as you can before layering in your club wrap. This will prevent a soggy wrap. 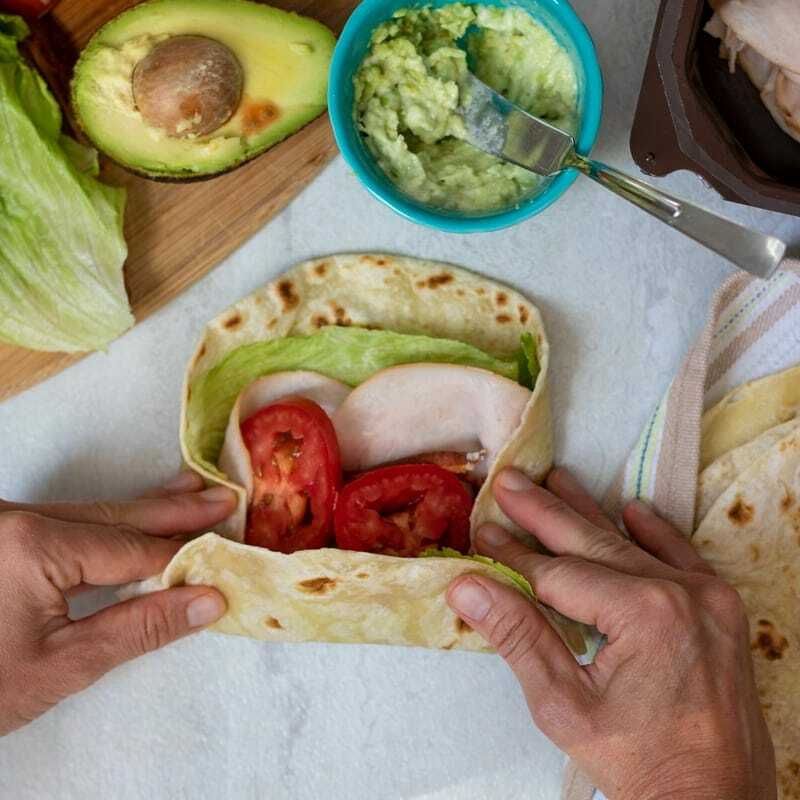 Deli turkey, lettuce, tomato, avocado, and bacon are wrapped up in a tortilla for a quick turkey wrap, perfect for lunch. Mash together the avocado with the mayonnaise, salt and lime juice. Spread the avocado mayonnaise in an even layer over the tortilla, leaving a 1/2 inch border around edge of tortilla. Top the avocado spread with 1-2 lettuce leaves to cover the tortilla. Place 3-4 slices of turkey in the middle of the wrap and then top with sliced tomatoes and a piece of cooked bacon. Wrap the turkey wrap, by folding in the sides and then rolling tightly from the bottom up. Cut in half or cut into 1 inch pieces and secure with toothpicks. These Turkey Wraps are great served with a side of Guacamole for dip. I like to add a Wholly Guacamole in my kids' lunchboxes for them to dip their veggies, chips, or these tortilla turkey wraps in.